Double dose of wildlife interaction during last night's riverside walk: 1) a very looong, healthy garter snake zipped across the rock I was about to step down to - causing me to scream like the girl I am, thus opening the door for conversation with a couple other girl walkers who wished they could have seen the speedy snake, too; 2) the huge crawdad in today's photo kept coming back after we spooked him by getting too close. 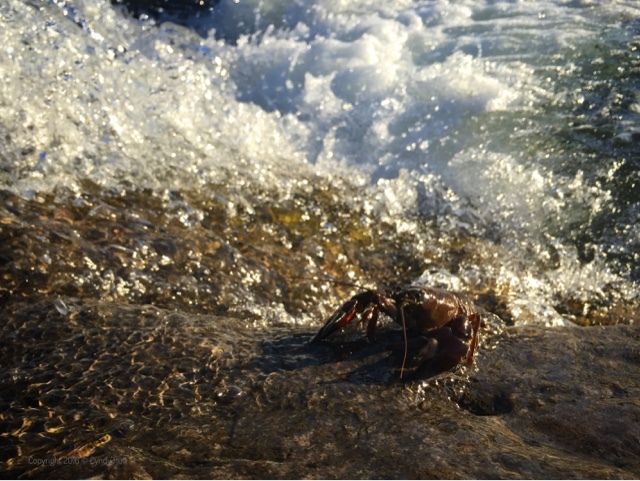 It was a bit fascinating to watch as he tucked tail to hustle backwards away from us into the crashing river surf, and to speculate whether he was put off by the noise or our shadows - or perhaps crawdads can see out of those beady little eyes better than you'd think. By the way, when you come to visit, it's a good idea to wear water shoes at the river. Yes! Much merriment over the snake-inspired screech. Kept thinking if M or M were with me, we would have caught the snake, and eaten crawdad for supper.